Paris Saint-Germain and Juventus both only needed to avoid defeat over the weekend and they would have successfully defended their respective league crowns. Both, however, fell to shock defeats. Juventus let a 1-0 lead over SPAL slip, while PSG were dealt their heaviest league loss since 2000 after Lille smashed them 5-1. Juventus ranked 24th in our team form rankings from Europe’s top five leagues prior to last weekend’s action but have dropped nine places as a result of losing to minnows SPAL PSG, meanwhile, occupied fifth spot in last week’s team form rankings but are now 30th after being blown away by Lille. Thomas Tuchel’s side have inexplicably dropped four points in their last two league outings. Bayern Munich were top of the pops last time around and the Bundesliga giants have only increased their lead following a routine 4-1 win away to Fortuna Duesseldorf on Sunday. Niko Kovac’s side have won five of their last six in the league and scored 27 goals in that time. Manchester City were the closest side to challenging Bayern for first but Pep Guardiola’s side have actually dropped into third despite winning 3-1 away to Crystal Palace on Sunday. City’s weighted rating over their last six matches has dropped due to the fact their 6-0 win over Chelsea no longer falls in that bracket. RB Leipzig have instead usurped City into second. The German side are unbeaten in their last six in the league and have won four on the spin following their 2-0 win at home to Wolfsburg at the weekend. Leipzig’s strong finish to the season has made them favourites to finish third after opening up a six-point lead over fourth. 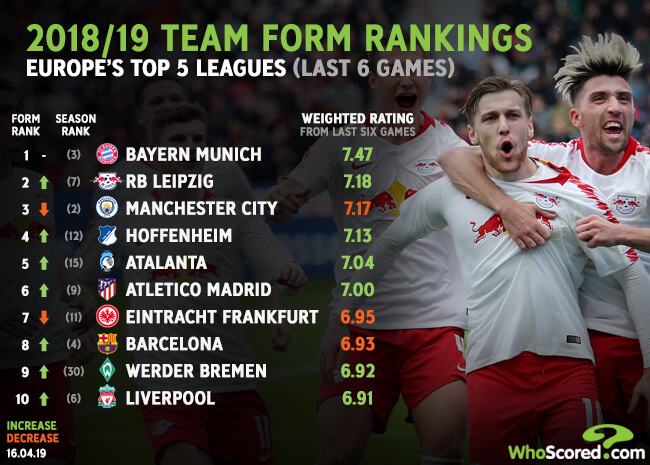 Hoffenheim are another Bundesliga side on the rise after moving up three places into fourth from last week’s edition of our team form rankings. Hoffenheim have won four of their last five in the league, including each of their last three and are now only five points off fourth with five games left to play. Julian Nagelsmann’s side managed to close the gap to fourth over the weekend after current occupiers, Frankfurt, slipped to defeat at home to Augsburg. With their minds on their Europa League quarter-final second leg, Frankfurt picked up their first league defeat since before Christmas and drop four places in our team form rankings as result. Frankfurt’s decline benefitted both Atalanta and Atletico Madrid, who both leapfrog the German side in our latest team form rankings. Atalanta played out a remarkable 0-0 draw with Empoli on Monday night, where they managed 47 attempts to Empoli’s 3 and 18 shots on target to their opponents’ one. Despite failing to get past Empoli’s goalkeeper, Atalanta are unbeaten in their last six league matches. Atletico, meanwhile, cut the gap at the top of La Liga to nine points but it is too late in the day to catch Barcelona. Atletico ran out 2-0 winners over relegation threatened Celta Vigo and have now won four of their last six. Diego Simeone’s side break into the top 10 form rankings as a result and place sixth. Barcelona, Werder Bremen and Liverpool round off the top 10, with the latter pair new entrants. Bremen are up six places after wrapping up their fourth win in six league matches at the expense of Freiburg, while Liverpool place 10th following their 2-0 win over top-six rivals Chelsea on Sunday. Team form ratings are weighted chronologically, with the most recent match carrying greater importance and so on.